The world is changing in ways we never could have imagined, said Adam Pilarski, Ph.D., senior vice president, consulting, AVITAS, Inc. Along with these changing world realities, Pilarski said, we’re seeing uncertainty clouding the aviation market. Amid record profits for airlines, large deliveries and order books for manufacturers, and a rising percentage of leased aircraft, Wall Street remains cautious about what effect the low oil prices will have on the market, Pilarski said during the ISTAT Americas keynote address 29 February in Phoenix, Arizona. The conference drew nearly 1,800 attendees from around the globe, making this another record-breaking event for ISTAT. Pilarksi said the high oil price environment of previous years created the new realities of today, including developments in aircraft and engines. "It’s a fact of life; it happened," he said. "This omelet cannot be unscrambled. We cannot go back." He predicts that airlines will continue to expand and profit and that oil prices will rise but not above $70 per barrel for a long time. "Those who invested in new technologies may not reap all the benefits that they hoped for," he said. Randy Tinseth, vice president of marketing, Boeing Commercial Airplanes, also outlined several areas of concern for the industry. Similar to Pilarski’s list, these included state of the global economy, oil price volatility, geopolitical hot spots, air cargo demand, airline labor, FAA reauthorization, among others. John Leahy, chief operating officer - customers, Airbus, spoke about a cautious approach toward production levels during his presentation the first day of the conference. He said that people looking for a cyclical industry to return shouldn’t look to Europe. "This is no longer a cyclical industry," he said. "My biggest fear is being able to produce everything we’ve sold." Look for more ISTAT Americas coverage in the Summer edition of Jetrader. Presentations and photos from ISTAT Americas are now available via the ISTAT mobile app and the ISTAT website. Join over 500 attendees in Tokyo for ISTAT Asia, Tuesday, 17 May – Thursday, 19 May, to explore Asia's growing influence in aircraft leasing, financing, trading and manufacturing. Register today to gain insight on the future of aviation in this region and network with colleagues and industry leaders from around the globe. View the schedule of events for more information on evening receptions and networking opportunities, keynotes and featured speakers. Hear speakers from All Nippon Airways, Japan Civil Aviation Bureau, HNA Group, Airbus, Boeing, Far Eastern Air Transport, Hong Kong Express, Jeju Air, Juneyao Airlines, Korean Air, MRJ, Okay Airways and Transportation Partners. In order to ensure our communications program is continuing to serve your needs, we need your feedback on an important readership survey for Jetrader magazine, the annual Membership Connections, and ISTAT UPdate eNewsletter. The survey will take about five minutes to complete, and your responses will be strictly confidential (data will be distributed in aggregate form only). Thank you for your continued support and your time! It is time to update your member profile to be sure we have the most current information in our database for the 2016 Membership Connections member directory. Your updates must be added to your personal member profile by 30 May 2016 to be included in the 2016 directory. If you have any questions regarding this information or need personal assistance updating your profile or uploading your photo, please reach out to ISTAT by email at ISTAT@istat.org or by phone at +1-312-321-5169. ISTAT is pleased to announce that Richard Owen Walker, head of leasing & investor marketing, Airbus, and Marilyn Gan, senior vice president, DVB Bank SE, have been elected to serve on the ISTAT Board of Directors. 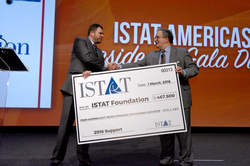 During the ISTAT President’s Gala Dinner at the ISTAT Americas conference in Phoenix, Arizona, earlier this month, ISTAT President Marc Allinson presented ISTAT Foundation Chairman Damon D’Agostino with a check for a $467,500 grant from ISTAT to the ISTAT Foundation. 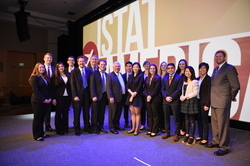 The ISTAT Foundation also welcomed 13 students from the Scholarship, Internship and ISTAT University programs to the ISTAT Americas conference. "I was privileged to have worked in global aviation for several decades and Asia has been a major driver of growth," Norman C.T. Liu said. "I hope this fund will enable many Asian students to pursue career paths in our critical industrial sector." The ISTAT Foundation is actively accepting applications for the Scholarship, Internship, ISTAT University, Grants and Humanitarian Aid programs. 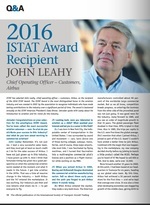 In the recently published Spring edition of Jetrader, we spoke with ISTAT Award Winner John Leahy, chief operating officer - customers, Airbus. Leahy shared memories from his illustrious career at Airbus and his outlook for the future of the industry. "Our focus will continue to be producing aircraft that are more fuel-efficient, cleaner, quieter, more comfortable and able to carry a larger number of passengers to ease congestion. And we want to do all of these things faster. Speed is key," he said. Advertising space is now available in the Summer issue of Jetrader magazine – the State of the Regions: Asia Pacific. Beyond our normal distribution to all ISTAT members in both print and interactive digital editions, this issue will have significant bonus distribution inside the ISTAT Chalet at the Farnborough International Airshow this July. For year-round access to ISTAT members, please reference the advertising opportunities available through ISTAT and Jetrader by clicking here, or by contacting: Erik Henson, Jetrader media director at +1 352-333-3443 or ehenson@jetrader.org. Manufacturing Business Technology Emerging technology is no stranger to the civil aviation industry — airline operators and manufacturers are constantly looking at new technologies to reduce costs, improve efficiency and help them keep up with rising passenger numbers. However, new and emerging technologies have the potential to completely disrupt the industry, especially if they threaten to undermine airworthiness and safety standards. Here are three technologies that will make a big impact on the civil aviation industry in 2016. Manufacturing.net Virgin Galactic took another giant leap toward private space tourism with the unveiling of its newest SpaceShipTwo, named VSS Unity. The spaceship has been under development since 2012 and is designed to carry two pilots and six passengers into space potentially "hundreds" of times. The Virginian-Pilot It was a project so big, Karl Stoltzfus said, that he wasn't thrilled about undertaking it. But facing the prospect that the first plane known as "Air Force One" — an aircraft that shuttled President Dwight Eisenhower around the globe — could wind up on the scrap heap, it was a project he couldn't resist.